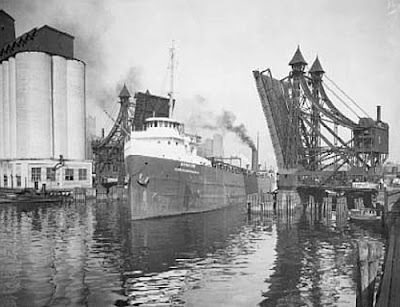 July 27, 1919: Sparks from the smoke stack of the lake freighter Senator start a fire that destroys the coal sheds of the Peoples Gaslight and Coke Company on the east side of the north branch of the Chicago River at Hobbie Street. The freighter had run aground as it moved past Goose Island, and the tug Racine was assisting it. The sparks from the ships set the roof of the coal sheds on fire, which then spread to two buildings at 1145 Larabee Street, prompting a 4-11 alarm, another day at work on the North Branch. The Senator didn't catch a whole lot of breaks. On October 31, 1929 she was rammed amidships by the steamer Marquette and went to the bottom, taking seven crew members and a load of 241 brand new Nash Ramblers with her.